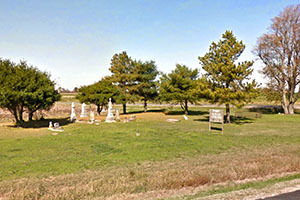 Byrne-Howard Cemetery is located at the intersection of State Route U & US-61 in New Madrid, MO. Howard, Elizabeth, d. Oct. 26, 1880, Dau. of J.H. & E.J. Howard, Age 20 Yrs. - Mos. - Dys. Howard, James H., b. Sept. 11, 1824, d. Nov. 10, 1903, Age 79 Yrs. 1 Mo. 29 Dys.